20120425 - Up and in to the office for a busy and exciting day, well Larry did lose his wallet... I had a review today and it went VERY WELL!!! The day ended and I headed out to eat with some coworkers from CA and the UK. 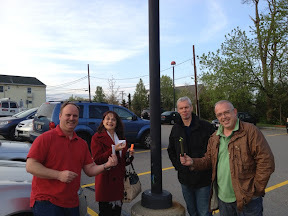 We had habatchi and over dinner conversation they discovered geocaching, so we gave it a try. The UK guys were quiet good and after finding the first one they wanted to do more, so we did 3! What a good end to a good trip.